Ingland i/ˈɪŋɡlənd/ is a kintra that is pairt o the Unitit Kinrick. The name "Ingland" cums frae the Auld Inglis name Engla (or Angla) land, whilka daes mein "laund o the Angles". The Angles war ane o the Germanic tribes wha sattelt in Great Breetain in the Aerlie Middil Eilds. The Angles cam frae the "Angeln" hauf-iland in the Bay o Kiel aurie. Cordin til the Oxford English Dictionary, the farst kent uiss o "Ingland" referrin til the soothren pairt o the iland o Greit Britain wis in 897, an its modren Inglis spellin wis farst bruikit in 1538. The etymologie o the tribal name itsel is argiet bi skolarts; it haes been jalousit that it cums frae the shape o the Angeln hauf-iland, an angular shape. Hou an why a term derivit frae the name o a tribe that wis less significant than ithers, sic as the Saxons, cam ti be bruikit for the hail kintra an its fowk is unkent, but it seems this is relatit til the custom o cawin the Germanic fowk in Britain Angli Saxones or Inglis Saxons. An alternativ name for Ingland is Albion. The name Albion originalie referrit til the hail iland o Greit Britain. The aerliest record o the name kyths in the Aristotelitian Corpus, specificalie the 4t yeirhunder BC: "Ayont the Pillars o Hercules is the oshian that flowes aroond the Yird. In it ar twa gey mukkil ilands caw'd Britannia; thir ar Albion an Ierne". 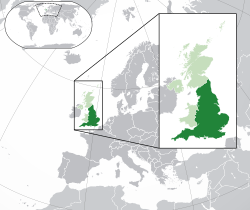 The wird Albion (Ἀλβίων) or insula Albionum haes twa possibil springheids. It ither cums frae the Laitin albus meinin "white", a referenss til the white cliffs o Dover, whilka is the farst sicht o Britain frae the European Continent. Anither springheid is suggestit bi the aunshient mertshand's haundbuik Massaliote Periplus, whilka mentions an "iland o the Albiones". A lot o historic Ingland's enemies, as the French, the Scots an aw, refer sumtyms til Ingland as "Perfidious Albion", ("La Perfide Albion" in French). This is an anglofobic name whilka seems ti be naitionalist an maistlins racist, the-day. But etymologicalie, "perfidious" anerlie meins: "whilka or wha disnae kep its, his or hir hecht, promiss". ↑ Office for National Statistics. "The Countries of the UK". statistics.gov.uk. Archived frae the oreeginal on 20 December 2008. Retrieved 1 February 2009. ↑ "Countries within a country". number-10.gov.uk. Archived frae the oreeginal on 9 February 2008. Retrieved 1 February 2009. ↑ Leuk at airticle "England"
↑ David Crystal, The Stories of English. The Overlook Press. ↑ Adrian Room (2006). Placenames of the World. McFarland. Wikimedia Commons haes media relatit tae England. This page wis last eeditit on 13 Mairch 2019, at 12:24.